Butter nonstick muffin pans or line with paper liners. In another bowl, whisk together egg, milk, sugar and butter. 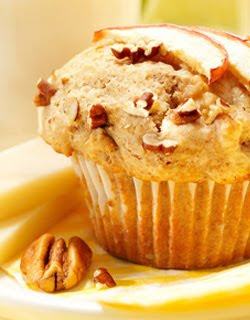 For a presentation purpose, sprinkle with extra diced apples and chopped toasted pecans. Bake for about 22- 25 minutes or until tops are firm to the touch. Let cool in pan for 5 minutes. Transfer to rack to cool completely. Tuesday a friend and I went on an adventure. Where did we go? 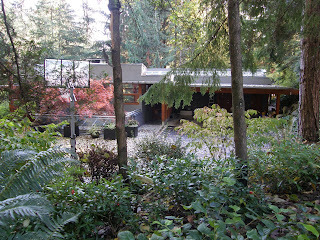 To visit some of the sets used in filming New Moon and Eclipse, the latest two Twilight movies. I have been to the sets before; you can see those adventures here and here. I will not admit to how much time I spend googling and searching for set info, but it was allot. Some of it was pretty easy to figure out, other's I had got from other fans. It was a 12 hour day. We put on roughly 300km on the car. 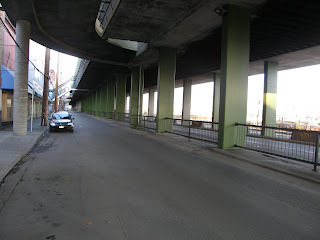 Crossed 6 bridges and thru 1 tunnel. All in all? Best day ever! We started off at Bella's house. 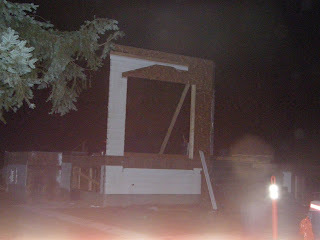 Crews started taking the house down last Wednesday. 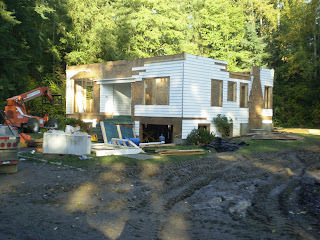 The house is(was) only a shell. I was really hoping the heavy rains we had last week would have slowed them down. We were excited to at least see what was left of the house. The friend I was with, she hadn't been to any of the sets so this was all new for her. 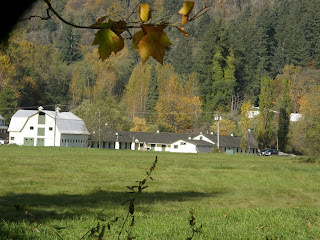 Next was off to a farm used for filming with Victoria and Rylie. 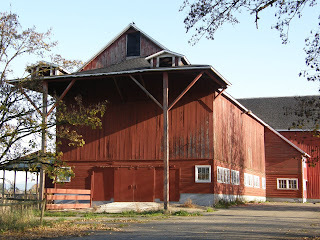 I love how only the bottom half of the barn is freshly painted lol. Than a house that is rumoured to be a few different sets. Is it Sam's house? Emily's? Maybe Angela's? Rumors were that this was used for New Moon too. Imagine our surprise when we got to this next location. 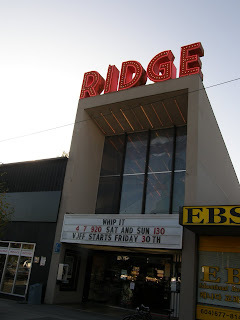 Fight scenes for Eclipse were filmed here. And what did we see? 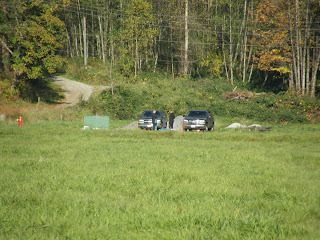 Security and black SUV's the transported the cast to and from sets. Our next stop was were the Forks Police station was built on the front lawn of prominent building. After a brief moment of panic with me losing my sunglasses, we were on our way again. 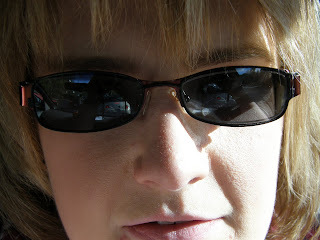 Where were my sunglasses? Right where I had left them. 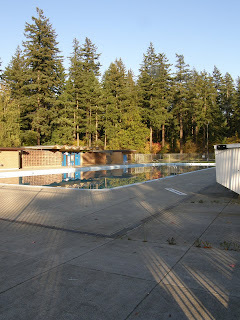 Stops 7 and 8 were a middle school used to film the graduation scene in Eclipse and a nearby park used for *the humans*. It was long past lunch. And who knew how hard it would be to find a fast food restaurant? 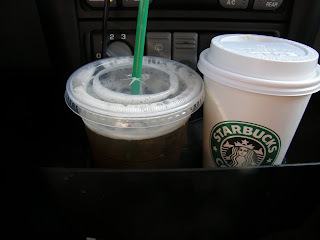 We ended up at a Starbucks were we were quickly hopped back up on sugar and caffeine. Next stop! 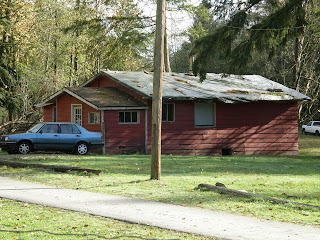 The Cullen house. The back of the house goes right down the hillside; beautiful. 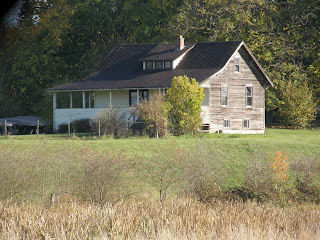 Now this house WAS used for New Moon. I've heard reports of a different house used for Eclipse and heard that all Cullen house filming was done in studio. I guess we have to wait until June 30, 2010 to know for sure. 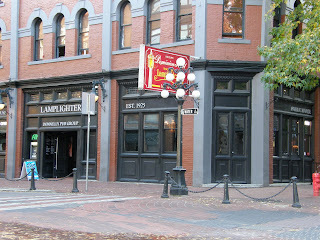 Lamplight Pub; used for more Eclipse scenes with Rylie and Victoria. 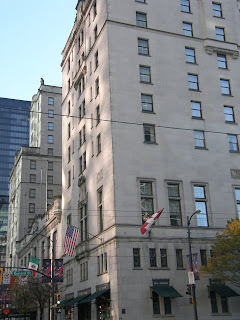 Fairmount Hotel; back in time filming telling the story of Rosalie and her fiancée Royce. Reports from the night filming occurred said that the street outside the hotel was lined with 1930s cars. 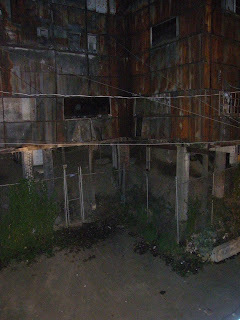 I knew about this set the night they filmed; I really wish I had of gone in and seen the filming. Theater scenes with Bella, Mike and Jacob here. 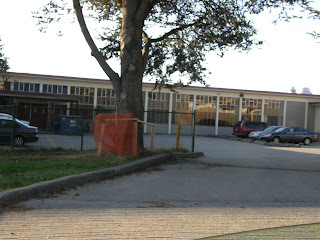 Vancouver's version of Forks High School for New Moon and Eclipse. A pool? YES! All the underwater scenes in New Moon were shot here using green screens. Now, we've been in the car for about 6 hours at this point. We have yet to find a fast food restaurant(our goal/hope was to see all the sets in the daylight so we didn't want to spend time IN a restaurant eating). 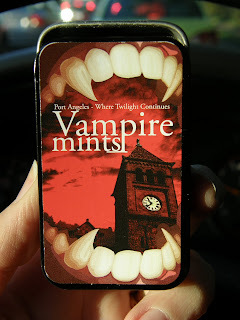 Thankfully I had a package of mints. HAD being the operative word lol! Last few sets were close together. I had a hard time narrowing down where these were. I had seen pictures but one google search lead me to a video. There was enough scenic footage in the video that I was able to narrow down the next set. Again, used as Seattle with the new born vampires in Eclipse. How scary does this alley look? This was probably the funniest set of the day. 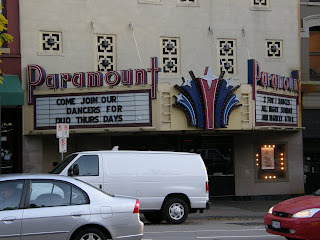 The Paramount USED to be a movie theater. Now, it's a strip joint. 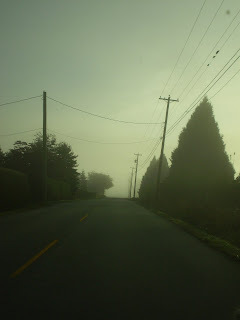 This was used in New Moon for when Bella and Jessica go to Port Angeles to the movies. And since it was on the way home, one last look at Bella's. So glad we did as this is all that was left. I've used this pattern twice this month. And I was pretty scared of it at first lol. I blogged about it here. 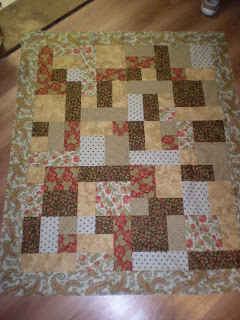 This first one, Charlene pieced for a wedding gift. 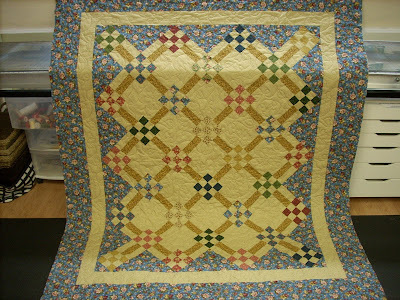 I had the quilt on the machine when Irene brought in a quilt she had made for her daughter. When Irene saw the pattern, she wanted it as well. I love how the pattern echoes out. 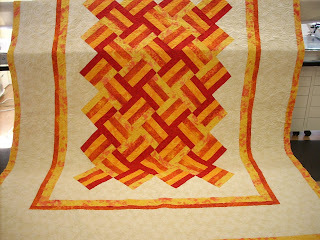 Both quilted with lava thread. 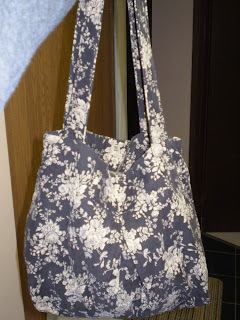 I started this bag earlier this month during our last bag ladies night. I found the corduroy fabric for $3/meter on clearance and I wanted to make the bag to take to hockey games. But I love it so much I use it all the time. I got the pattern from here. My bag turned out more square/rectangular than I had expected but still super cute. 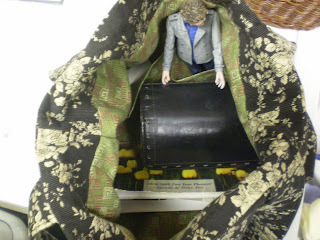 There is lots of room inside; I made extra pockets for my lipstick/gloss collection and of course I had to have one for Mini-E lol! From the Special Occasions Wall Hangings book. I love the shape of the tree. 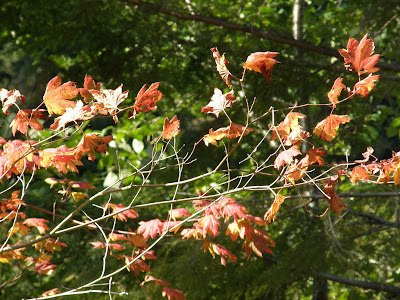 Hard to believe this is the last week of October already; wow this month has flown by! 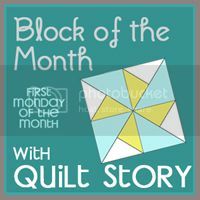 I didn't have time to take a picture of this weeks Quilt Monday last night. I had just a little bit of binding to finish so I figured I would finish that and post it later today. 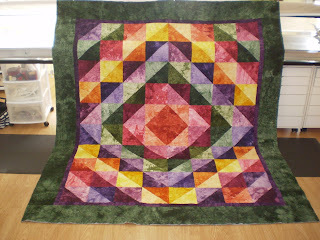 Barb pieced this quilt. She was looking for a bigger pattern to have quilted on it. I suggested one of my current favorites,Daisies and Loops. I really love the shape of the flowers. 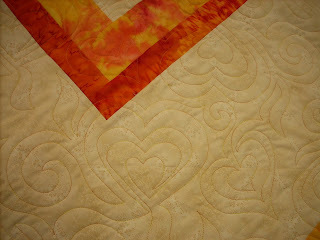 I love how they quilted almost perfectly in each empty spot on the quilt. Sorry for the unplanned absence. Wednesday we got a newsletter home from our boys's school; it was being closed Thursday and Friday because 40% off the school population had the flu. No one has confirmed if it was/is H1N1 but the school was told to shut down and is currently being entirely disinfected. 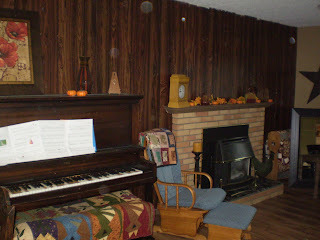 So instead of going into work or spending 2 bonus days crafting, I decided to tear about our family room and paint. Turned out to not be the smartest idea I've had. With 4 kids home and Jim trying to work, the only other TV is in his office. It was a tad chaotic lol. 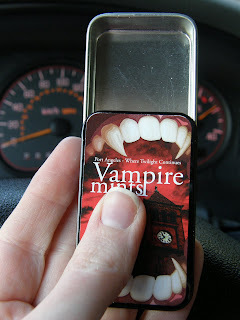 And with the painting decision being almost spur of the moment, I didn't have any time to schedule some posts for you. Sorry about that!! 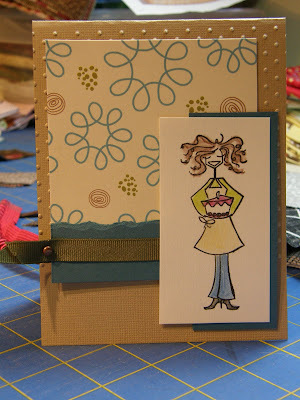 I did get two cards made today. 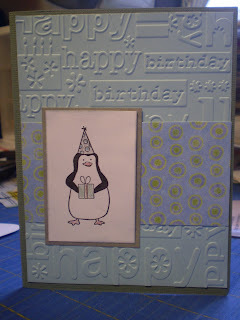 And yes, I used the penguin again. I have certainly gotten my $9 worth out of him!! I'll show the other card later next week. It's off in the mail for now. Line two large sheet pans with parchment paper; set aside. In a food processor or blender, process all of the Oreo cookies into fine crumbs. Add cream cheese and process until thoroughly mixed (there should be no white traces of cream cheese). Chill mixture 30 minutes. Using your hands, roll into walnut-sized balls, approximately ¾-inch in diameter. 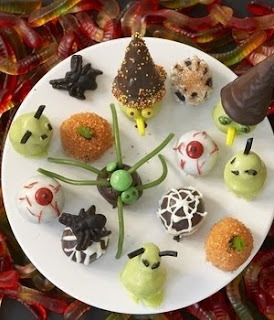 Place balls on the lined sheet pan and refrigerate for at least 45 to 60 minutes or freeze on baking sheets 30 minutes if you are planning to decorate right away. In the top of a double boiler over hot water, melt the coating chocolate, stirring until smooth. (If you don’t have a double boiler you can improvise one by placing a glass or stainless steel bowl over a pot of simmering water.) Remove from heat. Undecorated balls can be frozen for up to one month, just remember to freeze on a sheet pan first before transfering to a freezer bag. Cindy came over this morning to quilt. Neither one of us were getting anything done when we started talking about this post on decorating. 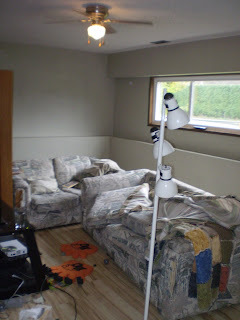 We have a huge wall in the living/dining room that is wallpapered. It was wallpapered when we moved in. I pulled the wallpaper off to paint instead and discovered 1970's dark paneling. So I took the easy route and slapped up new wallpaper. 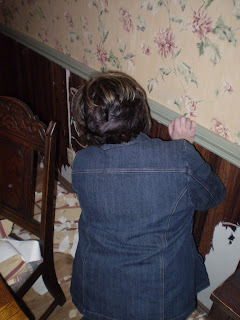 I've wanted to put drywall right up over the wallpaper and start fresh. I just had to convince Jim lol. 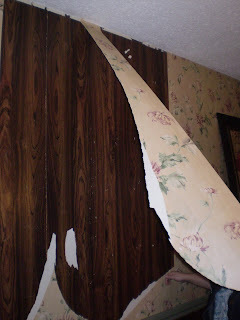 Than Cindy and I were wondering, what type of paneling was back there? Just a little bit. I figured if we looked at a small section, I could easily hide it. It's not like we use the dining room for more than folding laundry lol. 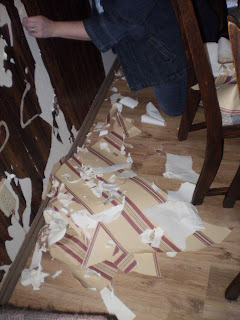 But than, the wallpaper literally just peeled off the wall. 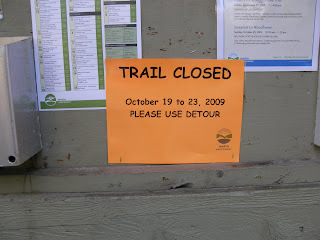 So we kept going. A quick clean up. 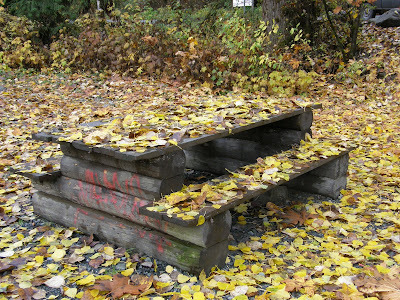 And we were hoping to sneak out for our lunch date before Jim realized what was going on. We even moved everything back. Sure looks different. 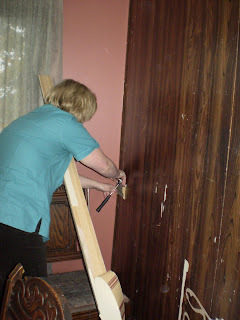 Jim and I have decided to attempt to pain the paneling. Should be entertaining. Good thing I love painting. Anyone want to come help? I love this idea. 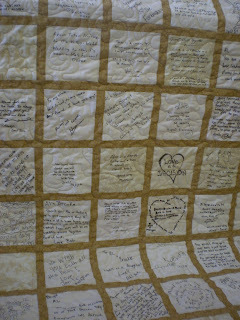 Barb had family/friends write messages to the bride and groom. 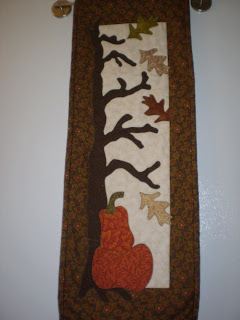 Than Barb sewed it all together(using Moda Chocolat. yum yum) What a wonderful keepsake. I didn't forget; it's still Monday lol! Hot off the presses; I LOVE this owl. I saw this little guy done up Jilly's Space and I had to copy him. Had a great weekend! Finished off my Peace on Earth quilt. 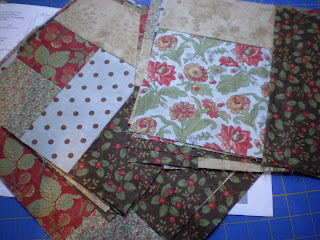 There are two spots that I'm not thrilled with the fabrics but I spent almost an hour moving the blocks around and around. Finally decided just to sew it together. 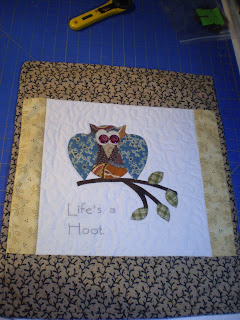 I also got something else finished but I'm saving it for Quilt Monday tomorrow. 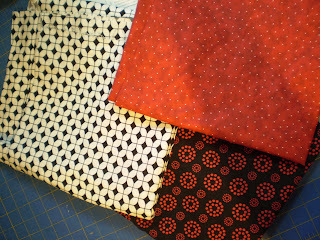 I'm just sewing down the binding and adding some button touches before it is officially DONE. 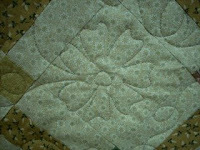 I was digging looking for batting when I discovered a forgotten about quilt pattern. 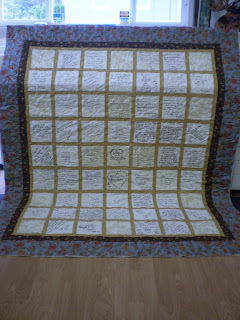 Well, it's now together and just waiting a few more quilting touches and it's another finish. 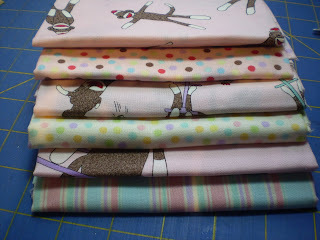 I didn't get started on the sock monkey quilt but I'm okay with that. I haven't gotten this much done in a weekend in a long time! 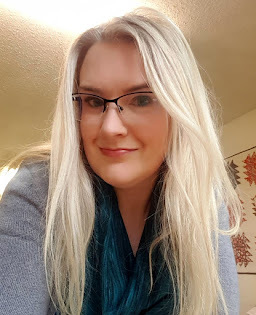 Hope you had a fabulous weekend as well! Today is a lovely raining day here. It's not even noon and I have dinner cooked for tonight and most of my Saturday chores done. 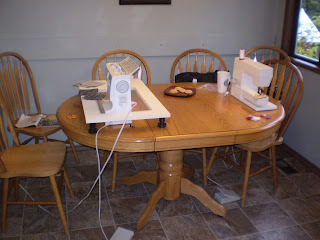 I am planning on spending the rest of the day enjoying my sewing room. 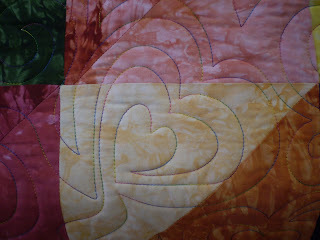 I'm hoping to finish up this Peace on Earth table quilt today. Blocks are finished; just need to piece the top and it's done. I have this little something waiting to be quilted. Totally stressing about freehanding it on my domestic machine. 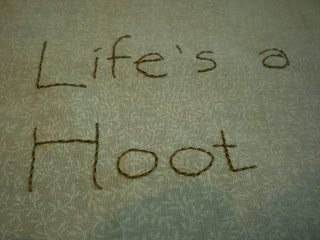 What I am saying-I would be way more stressed about freehanding it on my quilting machine lol. If I get both of those finished, I have an idea of what to do with these for an very quickly upcoming baby shower.